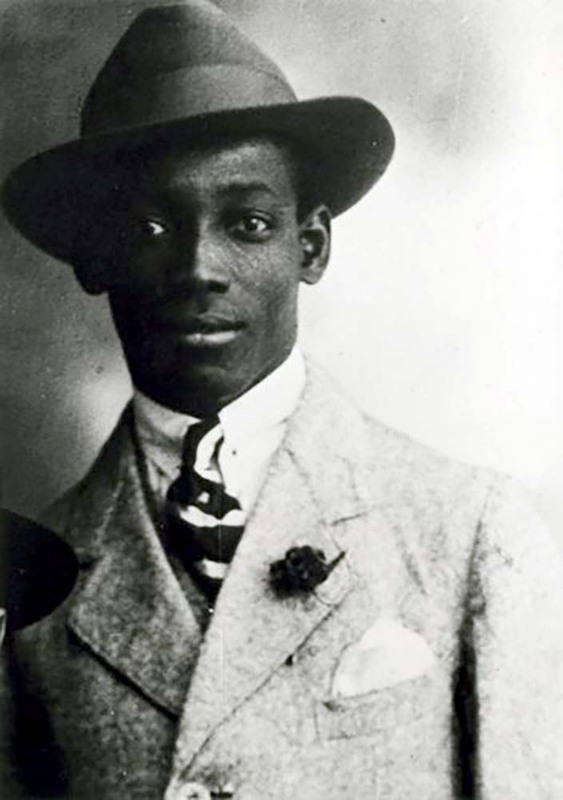 Anton de Kom (Cornelis Gerhard Anton de Kom) was a Surinamese author, anti-colonial activist, trade unionist, and World War IIresistance fighter. De Kom was born in Paramaribo, Suriname, a colony of the Netherlands, on February 22, 1898 to a former slave and farmer Adolf de Kom and a free woman Judith Jacoba Dulder. Much is unknown of his early except that he earned a secondary school diploma in accounting. In 1916, he found an office job at Balata Compagnieën Suriname en Guyana (Balata Companies Suriname and Guyana), a company that exported latex for consumer products. He demonstrated concern for his company’s new and unskilled workers, the formerly enslaved people, who endured poor working conditions. His support for workers’ rights gained him the nickname “Papa de Kom” before he left the company. In 1920, de Kom moved to Haiti and worked at the Societé Commerciale Hollandaise Transatlantique (Dutch Transatlantic Trading Company). Several months later, he sailed to the Netherlands where he volunteered for a year in the Dutch military. He subsequently worked for businesses as a consultant and salesman in the Hague, a city in the Netherlands. Outside of his work, he engaged in leftist politics and activities, often affiliating with leftish groups that opposed European imperialism and fascism. He then began to pursue an independent Suriname. In 1926, he married a Dutchwoman, Petronella Borsboom, and returned with her to Suriname in 1933 to reportedly visit his ailing mother. By then, the Dutch government had placed him under surveillance as a possible threat to the established order. The fears by the Dutch government became warranted. De Kom soon challenged the colonial administration by arming workers with information about their rights and organizing a strong united front with the workers. On February 1, 1933, he marched with a crowd of followers toward the governor’s office. Authorities arrested De Kom and charged him with attempting to overthrow the government. He was immediately imprisoned for three months in Fort Zeeland. Hundreds of people rallied to the jail resulting in an uprising. Preempting further labor disturbances, the government deported de Kom back to the Netherlands where he was welcomed back as a hero by Dutch communists and other supporters. De Kom’s continuing activism created chronic unemployment. During the period of Nazi occupation in the 1940s, he supported the resistance, writing articles in the outlawed magazine De Vonk (The Spark) until he was betrayed and imprisoned in 1944. On April 29, 1945, de Kom died from tuberculosis in the Sandbostel concentration camp in Germany. Today, his role in the achievement of an independent Republic of Suriname in 1954 is commemorated throughout the country with a premier university, Anton De Kom University, and street in Paramaribo named in his honor. His image is engraved on Suriname’s currency and, in the Netherlands, a statue was erected in his honor. Alice Boots and Rob Woortman, Anton de Kom : biografie, 1898-1945 | 1945-2009 (Uitgeverij Atlas Contact, 2016).